Meg is a city girl from Philadelphia transplanted to a 19-acre farm in the Garden State of New Jersey. She started college wanting to be a pediatrician, but ultimately graduated with a BA in theater, a minor in English, and her best friend and husband, Neal. 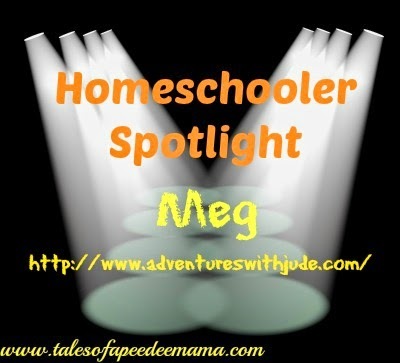 She homeschools their four boys while their daughter attends a private Christian school, and blogs about their experiences at Adventures with Jude. You can also find her at Facebook, Twitter, and her favorite social media site, Pinterest. When we first started homeschooling Jude, I knew almost nothing about how to choose curriculum, other than to put "homeschool curriculum" into a search engine. Not only does it give you hundreds of pages to choose from, it's hard to decide from a little bit of info here and there if a program is right for you. Some of the most popular "boxed" curricula pop up at the top -- but when you're first starting, you're torn between "It's most popular on Google's index, so it must be good..." and "Is it really that good or do people look at it and say, 'Nevermind.'" So then I started asking people, "What's the best <reading/math/science/whatever> program?" and got as many responses as people I asked. So what is the "perfect" curriculum? There is no one way to learn. 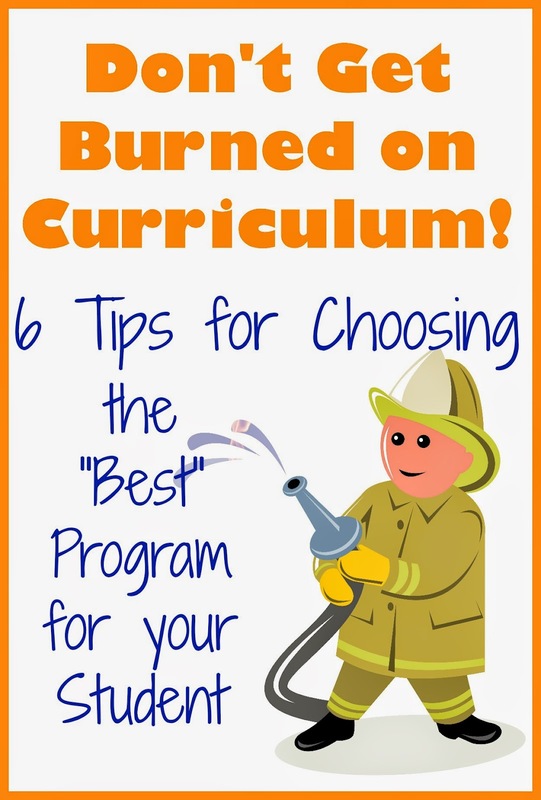 The perfect curriculum is the one that works best for you. So very zen, isn't it? Except when you're poring over catalogs and websites, you're not feeling particularly zen. Here's how we have been able to do pretty well at choosing things that work. I know, this sounds crazy. I know my first thought was "Oh, gosh, we need..." If you feel like you have to purchase something, buy some crayons, or poster paint, or a picnic cooler to take lunch to the park. Crayon and paint are good for all ages, and you'd be surprised how much even a jaded teen enjoys lunch sitting on a blanket. The only exception I'd make is a couple of student-chosen books for older kids, and even those you could probably get from a library. Lesson learned. Jude is not an auditory/reading learner. That's not to say he doesn't love literature. He does -- when it's presented in video form. He struggles to hear the story and imagine a still picture and process it all at once. But if you bring the story to life - through live action or animation - he retains every bit of it. Now I look for programs that are very visual, and any auditory instruction is secondary to what he sees, rather than book-based programs. If you're transitioning from a public/private setting to homeschool, take note of the child's interests, strengths and weaknesses. A struggling reader may benefit from audio texts; a child who loves science may be better suited to a unit study approach where a scientist's experiments are the central focus, with studying the biography of the scientist (literature) and the context of the era (social studies/history) provide other disciplines without being overtly "other subjects." Sure, every website that sells a particular item is going to extol its virtues. As my Gram used to say, "Ever hear a huckster holler 'Rotten Fruit'?" What you want to find are honest reviews, written by people that have used the programs. A good company will have a many parents' input. A great company will have input, even if it's negative. Why? Because what bombs for one child is perfect for another. I never put any stock in "This was stupid. Waste of money..." reviews, because they're not helpful. My go-to are reviews by the Schoolhouse Crew Review (full disclosure - because I also do reviews for the Crew, I know what their standards are, and tend to judge all reviews by those) and Cathy Duffy. I want to know WHY it worked (or didn't) for someone, not just "Great value! Love it!" Yes, I want a the best deals, but if something is really really good, and I think has a great chance of working, I'll pay for it! I just don't want to waste money, so I look for real-life reviews. If a friend offers her opinion, take it for what it is - her opinion. Consider her children's learning styles and if they match yours. A good friend of mine used to say "Ask yourself, 'Is this the hill you're willing to die on?'" If it's not, then yield. The battle I want to win is "Write a good book report." I've learned it's better to say "Choose a novel," and get an enthusiastic and well-written report on Mockingjay than an argued-over half-done Hemmingway. Sometimes I have to be more specific, but I try to give as much leeway as I can; last year Luke studied Edgar Allen Poe and I gave him a choice between Annabelle Lee or The Raven to pick apart, rather than just assigning something. Consider a university model, a semester plan, or another alternative; look and see if you can tweak something to work more easily. It's so hard to give up on a program, especially if it's not cheap. That literature-program-debacle was not an inexepensive mistake. (We kept the books and now read them "just to read," not to pick apart.) However, the beauty of homeschooling is being able to tailor the education to your child, not force your child into a particular curriculum. Sell it (you may not get the full value, but at least some money back helps take the sting out), shelve it for another child, donate it, whatever...but move on. Life is too short to fight every day over a curriculum. If you've had to say, "Ok, we need to change," go back to Step 1. Take a break from that topic, re-evaulate, and then start over. It'll be OK.